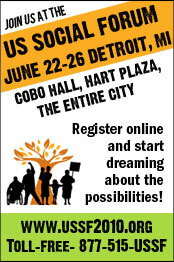 This week, Solidarity members will join thousands of other activists and organizers at the second United States Social Forum in Detroit, June 22-26. The USSF will combine educational and organizing workshops, protest, People’s Movement Assemblies and cultural events, all focused on connecting and advancing the struggles of working and oppressed people, and against war and ecological destruction. The 2007 USSF in Atlanta succeeded in bringing together new networks dedicated to everything from organizing domestic workers, to halting gentrification and urban displacement to discussing a revolutionary vision for the 21st century. As the capitalist and environmental crises grow deeper, spaces like the Social Forum are necessary for stronger analysis, militancy, and cohesion of social movements. This panel will discuss Left-wing memories and analyses of episodes in the politics and culture of Detroit during the 1950s and 1960s. Veterans of the movement will reflect on what those experiences reveal. Panel (still in formation) includes Melba Boyd, Black Arts Movement; Mark Solomon, chair, Michigan Labor Youth League; Ahmed Rahman & Ron Scott, Black Panther Party; Ron Roesti, Socialist Workers Party member and radical lawyer; Angela Dillard will chair. The combined budget deficit for the 50 states in 2009, according to the Center on Budget & Policy Priorities, was $190 billion. The stimulus package reduced that by $70 billion. For the 2010 and 2011 the projection is -$260 billion each year. States are usually mandated by their constitution to balance their budget so they must cut, cut, cut. Prediction is that 900,000 public sector workers, including teachers, will be laid off this year. Ruling elites view the crisis as an opportunity to impose belt-tightening, to further erode the public space by privatization, charterization, and a shrunken, powerless work force. Panel will discuss these attacks and how popular fightbacks can begin to rebuild public space. During the last presidential election, many of the larger, national feminist organizations as well as individual activists responded to Obama’s campaign with enthusiasm. But a year after assuming office, his record on reproductive rights is mixed at best. This workshop will begin with a discussion of how the political landscape in the US has shifted – and remained the same – since Obama took office last year. After this bird’s eye view, we’ll zoom in to hear about local struggles that reflect the intersectional nature of reproductive justice – that is, how reproductive issues overlap with immigrant rights, anti-racism, economic justice and class struggle, gender justice, LGBTQ liberation. Specifically, we’ll learn from organizers who are working to expand access to services for low-income women living with HIV/AIDS, to fight for rights and respect for welfare recipients, and to organize queer youth. We will explore how the challenges and opportunities that face these local campaigns have changed since Obama took office. And we will share ideas and organizing experiences about how to bring reproductive justice issues into community-based activism. Women’s struggles against violence, war, inequality and environmental disaster – these are the heart of the struggle for global justice. Val Moghadam and Nadine Naber, two scholars and activists with roots in the Middle East, will focus on women in the Middle East and Global South as they resist oppression and create the potential for transformative struggles. They will engage us in what we can do to build transnational ties. well as the growing right-wing fundamentalism and U.S. war. Bushra Khaliq is the national coordinator for the World March of Women in Pakistan and a member of the organizing committee for the Pakistan Social Forum. There will be time for paired discussion and small group breakouts during the workshop. Most of us are struggling by day for small victories to help our people organize and survive, and dreaming by night about a better world. This workshop is a space to gather with other non-sectarian revolutionaries to explore our visions in creative ways. Through play and discussion this session will provide a space to reflect on the challenges facing left organizers who are committed to bringing about revolutionary transformation. Let’s think deeply through the following questions together: What is our revolutionary vision for a new society (as distinct from a reformist vision)? What is the role of revolutionary organizations, collectives, individuals, and political communities to get us to that new society? How does being a revolutionary affect or inform our daily practice? We’ll have a game show featuring amazing organizers from around the country, play a spectrum game so participants can pitch in their thoughts, build virtual neighborhoods from cardboard and paint that weave together our visions of a new society, and have small and large group discussions.